Crawfish live on the bottom. That’s not to say you can’t catch a bass in open water with a crawfish bait. But a live crawfish will not leave the rocks unless it is forced to. During the summer, bass feeding patterns shift to low light or darkness. Again, bouncing a plastic craw over prime habitat in daylight hours can result in catching bass that are keyed in to the pattern, waiting for a midday meal. But for consistent action during dog days, move to deeper, darker rock substrate. 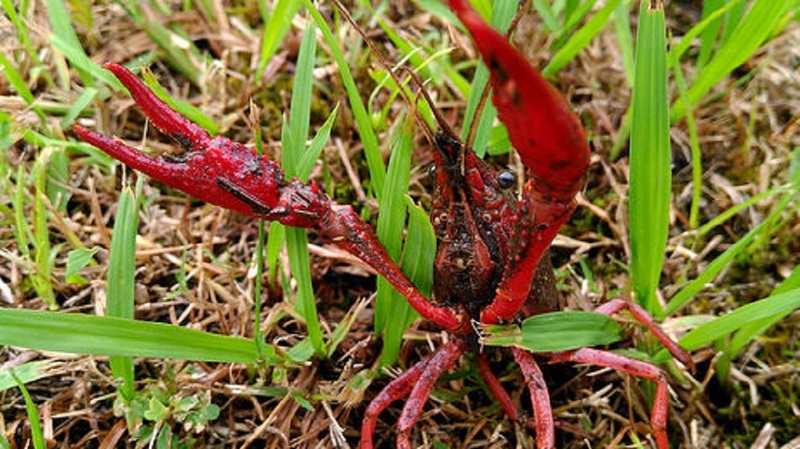 One of the best ways to fish crawfish baits, hard plastic or soft, is to work them parallel to rocky banks, changing depths until you find fish. One of the most important elements of making a believable presentation with a crawfish imitation is to keep contact with the rock or cover you are fishing. The ticking of a crankbait bill or lead sinker against a rock imitates the clicking of real crawfish — enticing bass to strike. Plus, contacting the cover ensures your bait is hugging the bottom, where crawfish live. Add internal rattles to plastic baits, and allow the bait to sit for an extended period of time. Small shakes of the rod tip will activate the rattles, drawing bass to your offering. Most importantly, follow closely the rituals of this favorite bass forage, and you’ll be catching bass on crawfish baits because of knowledge, not just luck. Ken Huddleston, the creator of the famous Castaic Trout, is now in the custom soft bait business. “I want to make the most accurate imitation I’m capable of manufacturing. Right now, I make all the baits personally and am committed to keeping my manufacturing in the U.S.A., and refuse to move it offshore.” Said Huddleston. If there has ever been a modern day renegade bait designer, Ken Huddleston is the guy. His attention to detail and assurance of perfect action has created an almost cultlike demand for the few anglers in the know. The Huddleston Deluxe Bait Co., makes a very lifelike crawfish bait called the Huddle-Bug. It can only be purchased at a select handful of shops in California. You can buy them on the Internet at Ken’s site (www.huddleston deluxe.com) for about $6 for a pack of five. Curt Samo, a fishing pro from Rockford, Ill., takes the guesswork out of color and size. In every lake or river system he fishes, Samo launches a crawfish trap the day before the tournament he is fishing. He uses a simple South Bend Crawfish Trap, and stops at the local convenience store on the way to the lake and buys cat food for bait. “I walk several yards down the bank from the boat ramp, because it’s almost always a rocky shore, set the trap and leave it overnight. In the morning, I pull the trap and see the color and size of the local population, match the baits and get to work. On a northern lake, Samo found an almost fluorescent orange crawfish occupying the trap. “I changed baits, matched the color and have cashed a check in 90 percent of the tournaments I’ve fished on that water since,” said Samo. John Tertuliani, a biologist for the U.S. Department of the Interior in Columbus, Ohio, completed his Masters thesis on freshwater crawfish, and is on the cutting edge of crawfish behavior relating to bass. Tertuliani’s research was instrumental in developing this story.